In Lock Mode, the yaw, pitch, and roll axis work together to keep the camera pointed in one direction. The camera's composition will stay the same no matter how you move the handle. Quickly lock your camera into any position by manually pointing and holding it in any direction. After a few seconds, the camera will lock and hold its position until it is reset back to default. be operated in conjunction with any of the Lock and Follow Modes. movements. 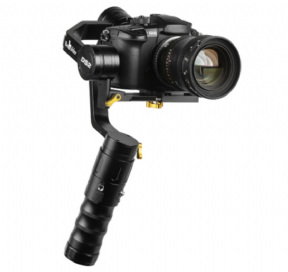 In Pitch and Yaw-Axis Follow mode, the DS2 will follow your pan and tilt movements. Finally, the 3-Axis Follow Mode gives you full control allowing you to pan, tilt, and roll. The DS2 has a 60 second auto-sweep feature that allows you to program a 60 second movement. in a 60 second time frame. tripod, jib, or dual handle support system such as the Ikan DGH. Shipping Dimensions: 15.1 x 8.8 x 2.9 in.